Description: Local heading South along the River Div in Festus at what once was the area for the siding for the Festus station. Description: MPASSUP charges toward Superior, WI. Description: SB autorack on the BNSF (ex-ATSF) Galveston Sub approaching the diamond with the UP (ex-SP) Glidden Sub, 1358 hours. 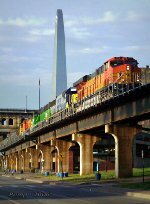 Description: BNSF Train H TULGAL1 22 moves up TRRA above the Mississippi Riverfront, but under the Eads Bridge. I miss these cool BNSF consists that BNSF used to come up with on a fairly regular basis. Description: BNSF 515 along with 7309 and 909 bring in a late Q64906. Description: A rare BNSF unit leads local NS #G28 through the street in Montezuma, GA. Description: Right rear trucks of BNSF 515 sit on the ground at Blakely GA. Description: The middle unit of 3 is shown on the ground at Blakely GA. Description: BNSF 515 recently derailed while passing through a switch at Blakely GA. Description: BNSF Emplyee Special crossing Carlyle Lake. Description: Coming back east through Mazon. Description: BNSF B40-8W 515 leads a passenger special into Verona. 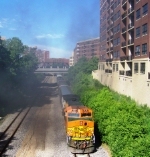 Description: The smoke still lingers in the air from MILW 261's passing as the BNSF brings up the rear of the EAS. Description: Heading back through Wayzata. Description: What a lovely sight.